Interview with Author/Selfpublisher Mark Sommerset and giveaway! If you have a desire to live your dream, make people laugh, get down with some string music and long walks in the sand, then you have come to the right place. Infact there is an idllic island in the middle of our harbour just beyond a volcano where my guest enjoys doing just that. 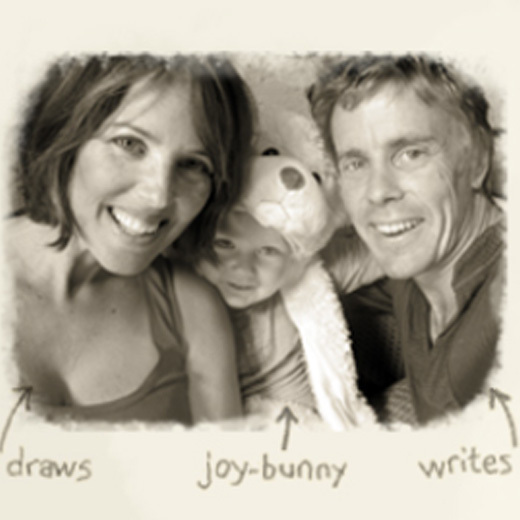 His dreams have evolved into a family publishing business with his lovely wife Rowan, known as Dreamboat Books. Join me on a comfy sofa with glass of wine, beer or hot chocolate in hand, for a very insightful and fun interview with my guest Mark Sommerset…. Me: Tell us how you first came to start writing children’s books? Mark: I had been singing and playing in a band through my early 20s and started writing my own songs – acoustic, somewhat folkie sort of stuff. I spent hours and hours playing with melody and rhythm but it was the craft of lyric writing and the cadence of words that I enjoyed playing with the most. I’m not sure if I had ever seriously considered writing children’s books but, just short of my 30th birthday I spontaneously wrote a short story over a couple of hours about a young boy trying to summon the courage to cross a river to reach a beautiful tree. Although at the time I wasn’t entirely sure why, it was a very powerful experience for me, leaving me both exhilarated and emotionally drained all at once. It dawned on me over the coming months that I had quite unconsciously written my own story – essentially a boy with a strong desire to be somewhere else, doing something different, only to be held back by my own fears. I was already hooked on the beauty of words but the way in which this story revealed to me my own state of being really captured my imagination. I personally love stories that can be interpreted on a number of levels: symbolically, emotionally, spiritually and literally. Striking a balance between these interpretations is a fascination I enjoy experimenting with in almost all of my writing. Me: How does music and the arts influence your writing today? Is it a lot or a little? Mark: It’s hard to know for sure just how much I am influenced by music and the arts -– so much is absorbed subliminally. I have written a song for a wordless picture book about a couple of rabbits that Rowan is really keen to illustrate and package with a CD but the song was inspired by the story, not the other way around. As far as other artistic inspiration goes, well there’s nothing like the epic beauty of mother nature to propel me into a creative frenzy, or a innovative, witty movie perhaps (most often animated like Rango, Howl’s Moving Castle, The Fantastic Mr Fox, Sherek, etc.) or a beautiful, thought-provoking picture book (The Giving Tree, The Chicken Thief, The Red Tree, The Incredible Book-Eating Boy, and, more recently, I Want My Hat Back, to name a few) or a novel with a compelling storyline and big heart (The Curious Incident of the Dog in the Nighttime, Holes, The Hobbit, The Little Prince, The Miraculous Journey of Edward Tulane being among my favourites). Not sure if jokes fall into the arts category (at a streeeeetch – no? )but they can be a source of real inspiration too, as in the case of Baa Baa Smart Sheep! Really when it comes to inspiration, influence, and engaging the creative flow the most important thing for me is to foster a sense of harmony and quiet within so I might hear the next big idea land. An exploratory walk somewhere I’ve never been before is always good, or sitting in a busy old pub in a very old city (need to leave New Zealand for that one). That’s true. But perhaps the one sure-fire thing I can do to turn on the receptors and tune in is take an ocean swim, followed by a glass of cold beer or good wine (during the summer at least). 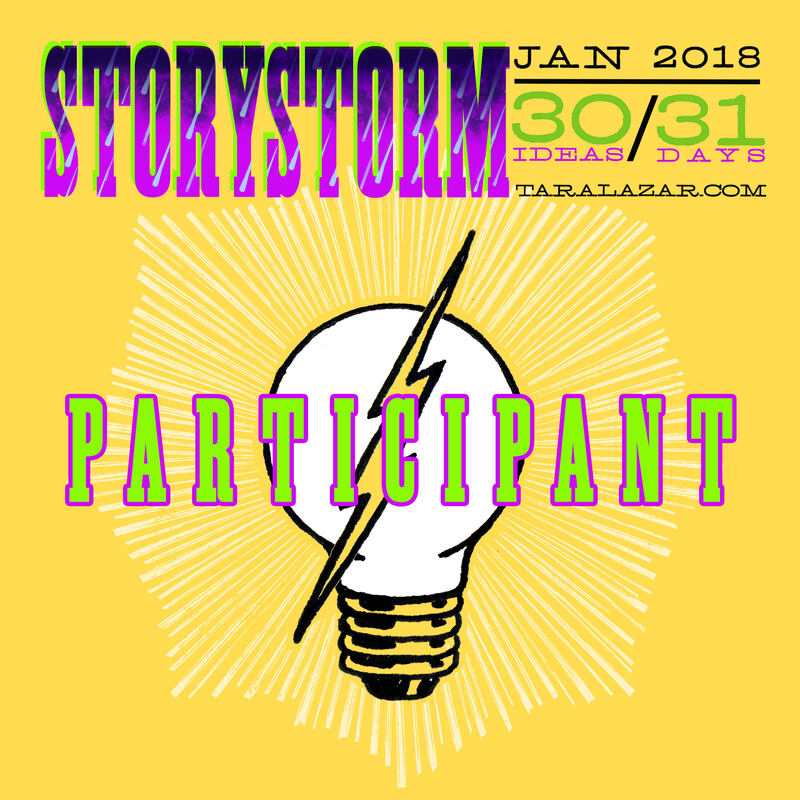 Me: As I am reviewing another of your books called “Cork on the Ocean” on Friday, for my 12x12x12 writers group here on my blog, can you tell me how you came to write that particular story? Mark: Rowan and I were sailing with Rowan’s mother and partner from Southern New Caledonia to the Island of Tanna in Vanuatu. We were enveloped by a storm and what should have been a pleasant 27 hour sail turned into a 62 hour ordeal in 50+ knot winds and four metre swells. I was really seasick and in my longing to be free of what I perceived to be my waterborne prison I sought refuge in my imagination by imagining myself as a Cork on the Ocean, riding the waves, untroubled by the unpredictability of the swell. It didn’t help with my seasickness but at least gave me plenty to think about (besides my impending doom!). When we finally reached safe harbour, the entire crew lay down for a morning nap and slept for 22 hours. By the time I woke up I found I had more than just the bones for what would become my first published book. Me: In a husband and wife partnership how has it worked … who has the ideas, is it illustrations first or text first? Mark: Like any marriage, Rowan tells me what to do and I do it (lol). But seriously, it’s a process of total collaboration which usually starts with a completed first draft of a story idea I have had. Rowan then edits it – we argue, we laugh, have lunch, laugh and argue some more – then make changes as need be. We repeat this process when Rowan comes to illustrate the book. For me it is a real gift having Rowan to share my writing with, not to mention the opportunity to be so involved in all aspects of book design and illustration. I trust her inspirations and consider her an excellent editor of my work. On those rare occasions where we find ourselves knocking heads harder than usual over a particular concept or idea, a better idea inevitably squeezes out the side. It’s a fun, fully collaborative process that is easy most days, only occasionally difficult, and one I wouldn’t wish to change for anything. Me: Can you give us a view into how Rowan did the illustrations for Cork on the Ocean and what did she use… ie paints, photoshop? Mark: Rowan’s process is a blend of the old and the new. She first sketches her drawings, often tracing over concept characters with the use of a lightbox until she has refined them to a point she is happy with. She then scans the images and renders, colours and augments them using a Wacom Cintiq tablet (the type with a screen in it) which she draws directly upon by digital pen. By using the digital pen she is able to emulate and maintain the loose, easy style her sketches have. People familiar with Rowan’s illustrations often compliment her on her reserved, carefully chosen colour pallets and her ability to extract maximum expression of character out of minimal line use. Both of us have a love for engaging the imagination rather than spelling everything out. When it comes to telling story through art, I think it is fair to say Rowan is a less-is-more girl. If it’s not essential to the image or the design of the book it gets axed. Rowan also hand-writes all her typography (even the tiny publishers imprint details!) which not only contributes the uniqueness of her illustration style but creates an uncommon sense of harmony between text and imagery. Me: I see “Two Little Bugs” (an earlier review, I did) was included by the International Youth Library in their 2012 White Raven Selection. How does it feel having your imprint out there? Mark: It’s really nice to have your work acknowledged by the industry, your peers and fellow booklovers but for me, as a self-publisher, it is more the opportunity an award presents than the accolade itself. One of the hardest things to get in the publishing world is noticed, and publicity and this sort of thing is worth its weight in gold. The White Raven selection has given our profiles a boost overseas, especially in that the book is featured as part of the International Youth Library’s display at both the Frankfurt and Bologna book fairs. We have recently had rights inquiries out of Europe and Asia, which have come as a result of the exposure. See post here. Me: What is next? A new story or continue of this series? Mark: There have been several stories on the bubble over the last year or so, including a reprised version of my original boy and tree story, and a tale about a little mouse with big dreams. As is often the case with us though, all projects were suddenly set aside four months back when I completed a 3rd version of a proposed sequel to Baa Baa Smart Sheep. It is tentaively called “Don’t be a Turkey” and it made Rowan laugh just as she had when she read my first draft for Baa Baa and Turkey’s initial encounter. Rowan and I are not overly pragmatic when it comes to deciding what book we should do next. We tend to work on what feels right moreso than what we think should be done. In a way it’s the books who tell us what’s next, not the other way around. Me: How have you found self-publishing, the ups and downs and what made you choose that process? Mark: When Rowan and I first started we were in the fortunate position of having a few key skills between us that made the prospect of self-publishing somewhat less daunting. The experience of running our own design agency (which included account and print management as well as copywriting and design) put us in good stead, and Rowan’s aptitude with the likes of InDesign and Photoshop meant she could take my words and her illustrations and design a completed book, ready for print. There were a lot of good reasons to notdo it on our own, to try and seek out a publisher for our work, but ultimately we couldn’t look past a few key benefits that self-publishing presented: 1) The freedom to produce a book just as we imagine it and the opportunity to publish whatever we choose, 2) Having control and taking responsibility for all parts of the publishing process (something we genuinely enjoy! ), and 3) A shot at make a living out of doing what we love. In many ways it was quite a naïve decision but today I am very happy that we made it. Self-pubishing certainly has it ups and downs (like when we received our first 3000 copies of Baa Baa Smart Sheep and the first one I pulled from the box the box had its inside pages bound upside down! That was a heart in the mouth moment I can tell you!) but overall it has been a fun process of creative experimentation and learning. Seven years on, the experience we have gained and the success we are starting to enjoy in our home market is leading us to greater possibilities further afield. One thing that is really interesting at present is dealing with foreign rights publishers as both an artist and publisher. For interested parties we have the flexibility of offering deals as a packager of books (ie, supplying printed and bound imprints of our books, royalty inclusive in a single per unit price) as well as remaining open to the option of signing as author/artists in a more traditional publishing arrangement. For a more complete answer to this question I wrote an article on our publishing process – the reasons and what-fors – for NZ Author Magazine. It can be viewed on our blog by clicking here. Me: As a member of SCBWI like myself are you intending to attend any of the conferences in LA, New York or Australia anytime in the future? Mark: Sadly not at present. I’m really focused on preparing for the Frankfurt Book Fair and our next book release. Hey, I just had a thought! I could buzz the SCBWI people and see if we could hook up in Frankfurt right? That would be cool. Anyway, I would like to attend all the events but it gets pretty expensive flying from NZ and I already have a fair few planned engagements that will be take me away from my family this year, so… maybe next year! Me: An obvious question but one we love to ask and are very interested in the answer.. is, what advice would you give an aspiring author? 1. Don’t set out to please everyone. Truth is, when I write, I set out to please no one but myself! I do this not because I am righteous and self-absorbed but because I want to have fun with my writing and to feel completely free when exploring whatever is on my mind. By not giving a hoot about what other people might think I also have a chance of finding a clear and authentic voice, which I believe is necessary if your writing is to resound in the hearts of others. 2. Don’t be afraid of the editing process. I was pretty precious about my writing when I started out – what do you mean it’s too long? Why don’t you like that idea? I’m not changing that! No way! Nowadays, I’ve learned to enjoy the editing process for the creative opportunity it represents and have a real appreciation the refinement it brings to my writing. Incidently- As it turned out only about 15 of those first edition Baa Baa Smart Sheep books that were bound incorrectly. That’s one in 200. I would have to go and pick one of them up first! Oh My! Thankyou so much Mark, for your time and I have really enjoyed getting to know more about you and Rowan, your views and processes in creating such beautiful whimsical books for children. 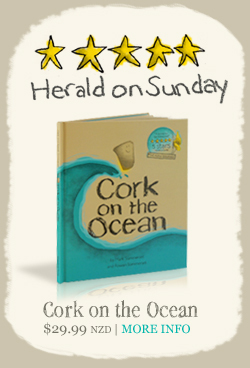 Also Mark has generously donated a signed copy of “Cork on the Ocean” for one lucky person who comments here on this post. If you have any questions you would like to ask Mark, he is more than willing to answer them. (the draw will be held Sunday pm (USA). Look out for my review of Cork on the Ocean on PPBF. Thankyou. This entry was posted in Children's literature, Interviews, Picture book and tagged Mark, Rowan, SCBWI. Bookmark the permalink. 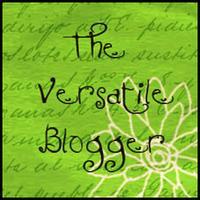 49 Responses to Interview with Author/Selfpublisher Mark Sommerset and giveaway! Fantastic interview! Mark sounds like such an interesting man, well-spoken (can I use that term when I’m reading an interview? ), knowledgeable, down-to-earth and creative. I know you’ve told us about this team in previous posts, so it was particularly fascinating to read his words. Thank you both for this. I’ll look forward to reading about Cork on the Ocean. I think. 😉 The experience the book grew out of sounds terribly scary to me! Thankyou Beth! Like any typical kiwi, Mark just tells it like it is. His website is interesting to. By the way, I’ve won several things in giveaways in recent months, so count me out of the giveaway (although the book sounds lovely) and give someone else a chance, okay? I really enjoyed the interview! Mark is a real creative. 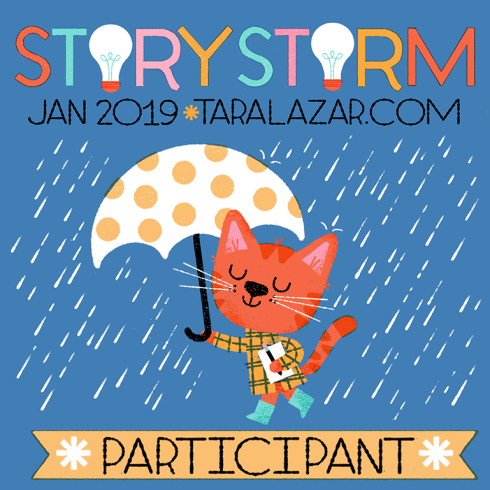 To be in the midst of a storm, find a calm place within to allow the seed of a story to germinate, no matter how the storm raged, is a remarkable fete and a very spiritual. I will look forward to reading the review of the Cork on the Ocean. Mark is fortunate to find a partner who shares his passion. I was very interested in his self-publishing efforts and the reasons for doing so. It is great they compliment each other and own their own publishing company. I liked his comment about pleasing yourself and writing what is true to you! Great interview Diane! I thought you would find their success story very interesting, Pat. The review of the book is coming up next. Thanks again. Fabulous interview, Diane! Thanks mark for sharing this with us. I love what you say about writing what you fancy writing and letting your muse decide, that is awesome! You do have an awful lot of skills between you that I really lack. Maybe self-publishing isn’t for me. We’ll see. Best of luck with all your books! Thanks again Diane! And yikes to the sea adventure! Yes they do seem to have a lot of skills between them. I am not such a techo-minded person myself. We shouldn’t let that interfer though. Goodluck with writing ventures Catherine. Thanks for taking the time to share all this information. Great interview and sounds like fun books and projects in the works. I admire any husband-wife duo. I agree, great team. Thanks Stacy. Hoot!! Hoot!! Oh, wait. I think I wasn’t supposed to give a hoot. Well either way, I loved your comments about writing that resonates and resounds because it comes from within one’s true self. Do you think it needs to be balanced with learning to write from a commercial/marketable perspective in order to feel ultimately “successful” (whatever that means) as a writer? Hi Cathy, thanks for the question. All I can say is I’ve never taken a course or ‘learned’ to write at all. Same for my music actually. I just write/create what gets me excited. I think you come to get a sense for what work is more commercial/marketable as you go along. I also think you run the risk of compromising your unique perspective/authentic voice if you set out to be commercial or rely on others to tell you how it should be done. Thanks for your comment Cathy, I too loved the heart message. Wonderful interview. Thanks for your honest and insightful comments. Thankyou Gillian, so glad you enjoyed this interview. Do pop back anytime. What a great interview! Really interesting, Diane and Mark. I loved hearing about your whole self-publishing journey. It’s really great that you and Rowan between you have so many skills. Seeing those books bound upside down must have been a tough moment! I’m glad it turned out all right! Thankyou or your comment Susanna and pleased you enjoyed the interview. I think I would have been really heartbroken to find the books bound upside down. Luckily it weren’t that many. Shows, the road to success is never smooth. Great interview! I learned a lot! I like how your wife draws and you write! 🙂 I will check out your books! Glad you enjoyed this interview Erik. Mark has been very generous in sharing his side of how the writing process and publishing works for him. His website is very interesting, enjoy. Pleased you enjoyed this kathy, pop back anytime. You are very welcome Nicky. Please to see you had some camparisons with Marks publishing journey. Wonderful that you took the time to check out Mark and Rowan’s website and FB pages. Do pop back again. Loved your story about how you came up with your idea. Ideas are everywhere! Thankyou Beth for your comment. Do pop back again. Love this and love, love the illos! So cute! Thankyou illustrationjunky! Isn’t it cute!…lol. Glad you enjoyed the post Brenda. Check out Marks Website and hear more from him and Rowan. Do pop back again, loved having you here. Wonderful interview Diane and Mark. 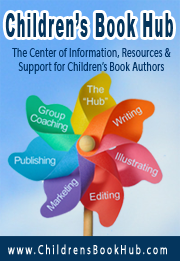 Thanks for sharing and the helpful advice for aspiring authors. #1 is a big stuggle for me at times. Pleased you enjoyed this Jennifer, and found it very helpful. Do pop back again. Great interview! 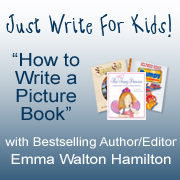 I enjoyed reading about the creative process and the advice about writing to please yourself. That really resonated with me. I was going to ask about distribution and marketing, but you’ve answered that question nicely in your NZ Author Magazine article. Thank you! Pleased you found this interview and the links useful to you Heather. Do pop back anytime. Oh, and don’t enter me in the drawing. I’ve won a couple over the past few months. I commented because it’s a great interview! What a great interview. I love hearing about creative teams and collaborations and this was no exception. I loved hearing about your whole self-publishing journey – what a bounty of gifts and skills. Seeing those books bound upside down must have been hard! Cork on the Ocean sounds a cracker! Hi Joanna. I can just imagine you and Mark discussing publishing over a glass of wine at one of the Writers Conferences. Mark is very approachable, with much knowledge . Review of the book, coming up. A quick note to everyone for your nice messages and thoughtful comments. Yes, Rowan and I are very fortunate to have the skills (and the passion) between us to do what we do. I am ever grateful she called me for that first date! 🙂 Thanks to you Diane too! Thank YOU Mark for allowing us to view your writing process and sharing your publishing journey. Incidently, you may not be aware, but Erik a fellow writer and reviewer of children’s books, (whom we are proud to have among us) is only 10 years old and already has his own writing column in his hometown local rag. His website http://thiskidreviewsbooks.com/2012/05/18/perfect-picture-book-friday-oh-no-or-how-my-science-project-destroyed-the-world/ is very impressive. Thanks again Mark. Readers the review of “Cork on the Ocean” follows. Nice one! just went and checked out Erik’s site. What a great tool the internet is and great to see Erik making the most of it! Thank You Darshana, so glad you came back to read the interview and enjoyed it. Inspiring and fascinating interview! Thank you for sharing Mark’s journey with us. Glad you enjoyed it Julie. I hope you check out his interesting website. Love it! My husband draws and I write and I would love to put together a book with him. For now he creates illustrations for my blog. That would be really cool Rena if you were to do that! Would be lovely just having someone to share the experience. BTW your husband is a very cool illustrator… your blog looks cool. Thanks for stoppping by and come back anytime.